A fantastic evening of live Jazz, soul music, VIP lounge dinner , with incredible city views and dancing. We are pleased to announce the all-star lineup of award-winning artists and musicians. • David Osmond , a Music Artist, Producer, and an #Emmy Nominated TV Host of Wonderama. • 2 times 2018 award-winning fingerstyle guitarists, Camille Nelson ( She is the little sister of Steven Sharp Nelson from the Piano Guys) and many more incredible musicians from my band. There is only 15 VIP ticket available. VIP passes includes a special pre-show dinner, meet and greet plus photos with the artists at 6:30 PM, at Hardware Apartments in the luxurious rooftop kitchen villa. VIP Guests will experience the exotic Caribbean flavor and culinary delights of Celebrity Chef, Roody Salvator, recently featured on BRUT. 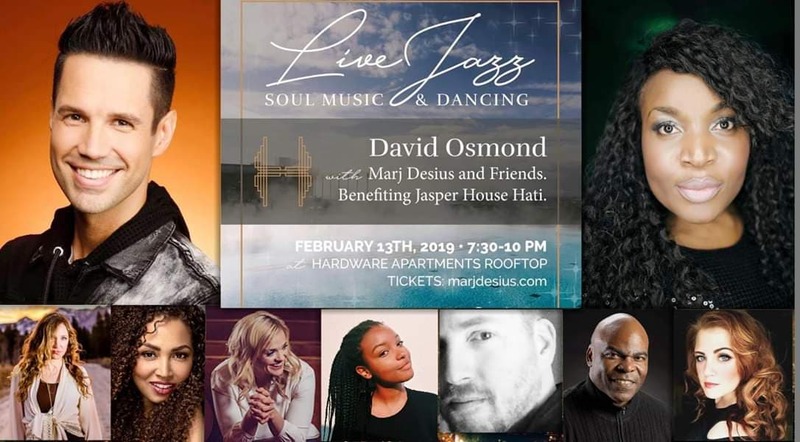 Proceeds of this e event go to Jasper House Haiti, a house of refuge, strength and opportunities for many young girls rescuers from prostitution , raped and so on. Previous articleGERVONTA DAVIS DEFENDS WBA SUPER FEATHERWEIGHT TITLE WITH THRILLING FIRST-ROUND TECHNICAL KNOCKOUT OF HUGO RUIZ SATURDAY ON SHOWTIME® FROM DIGNITY HEALTH SPORTS PARK IN CARSON, CALIF.